We finally visited a not-so-new local restaurant, The Terrace Café (www.WrenthamTerrace.com) and are absolutely thrilled to have such a welcoming in-town option for fine dining so close by! The restaurant is approaching their one year anniversary and we are happy to pass along the good word to help keep them busy and popular. 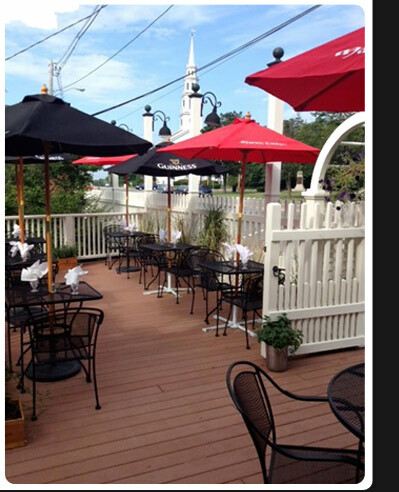 The space is cozy with an awesome outside patio for dining al fresco (the above picture nicked from their website does the patio proud…). The lack of AC did make for a slightly warm experience, but the light and airy space was never oppressive. Our server was charming – friendly, courteous and professional – attentive without being effusive. The owner, Nancy Lockwood spent a considerable period of time chatting with us, offering positive commentary on our wine selection. Speaking of which, the list is a nice selection of very serviceable bottles from a small distributor out of Weymouth (Masciarelli Wine Co.) – we had their estate bottled 2011 Montepulciano D’Abruzzo, which was a good summer-weight red and at $18.00/bottle it was a phenomenal value. Massachusetts’ doggy-bag wine law meant I was able to order the bottle and happily take the remainder home for consumption later. The food was great! I had the Pork Tenderloin with Potato Croquette and Broccoli, served with a pleasant cranberry glaze. The pork was perfectly prepared, tender, juicy and mouthwatering. Betsy had the Tower of Eggplant, a twist on eggplant parmigiana with alternating layers of eggplant, bell pepper and Mascarpone cheese. Pete had a very tasty cheeseburger with really tasty steak cut fries. All of our entrees presented very generous servings – none of us left hungry. We finished with a slice of Tiramisu, which was a decadent serving of cocoa-dusted creaminess. Despite these challenging conditions, enterprising vignerons plant vineyards on the foothills of Mont Ventoux and swear that the wind and weather contributes to the strength of the grapes pulled from their plots of land. Economically, a lot of producers choose to sell to the more popular producer/négociant houses to maximize their return on investment. The Perrin family, the house of Jaboulet and the Frère Delas are large investors in the Ventoux with really stunning results. Most of these wines are meant for current consumption and are perfect for summer, grilled fair. Ripe, jammy nose with bright fresh cherries, violets and dried herb hints. Medium-bodied with moderate acidity and soft, well-integrated tannin – good balance. Juicy palate with fresh, red berry fruit- easy drinking to a fault. Moderate length – smooth. Drinking well – not for aging. Great value! At an average price of $9.99 per bottle, this is a very strong value. I recently enjoyed a wonderful dinner at Russell House Tavern – great food, great drinks and even better company! Stir with ice and strain into a rocks glass over ice. Garnish with an orange twist.